In a separate large bowl, cover the dried beans with at least 3 inches water and soak overnight. The next day, in a medium saucepan over medium-high heat, add enough water to cover the salt pork by 2 inches and bring to a boil. Reduce the heat to a simmer and cook for 30 minutes, until the salt pork is supple. Drain, cool and set the salt pork aside. Drain the beans, rinse, and set them aside. In a large Dutch oven, heat the olive oil over medium-high heat. Add half the seasoned pork cubes and cook 10 minutes, until lightly browned; transfer to a plate. Repeat with the remaining pork cubes and set aside. Add the ham hocks to the Dutch oven and brown them lightly. Add the Andouille sausage, carrots, and onions to the pot and cook over medium heat for 7 minutes, stirring occasionally, until the onions are golden. Add the cut head of garlic and the diced tomato, and cook for 1 minute, stirring constantly. To make the Bouquet Garni: Gather the ingredients together in a piece of cheesecloth, and tie with butcher's twine. Pour in 2 quarts chicken stock to the pot and add the bouquet garni, cloves, boiled salt pork, the browned pork cubes, and the beans. Bring to a boil over high heat, then cover the pot with a tight fitting lid, and reduce the heat to medium-low. Simmer for 2 hours, stirring occasionally. Remove from the heat and discard the cut garlic and bouquet garni. Add the remaining 2 cups chicken stock to the Dutch oven, and season with salt and pepper. Bake the cassoulet, uncovered, for 1 1/2 hours. Reduce the temperature to 275°F. 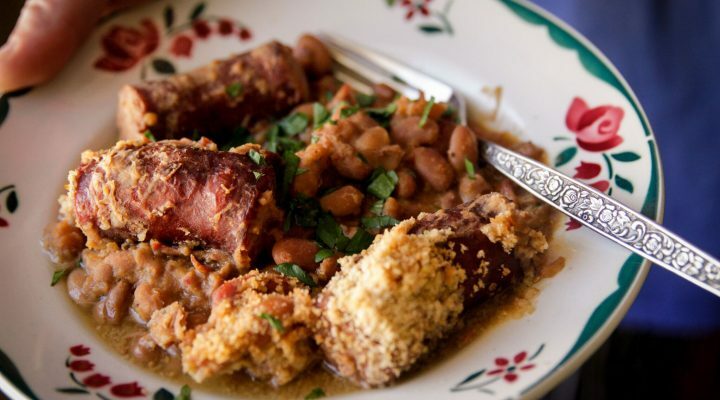 Gently stir the skin that has formed atop the cassoulet. Sprinkle with the bread crumbs, and bake for 1 additional hour, uncovered, until a rich brown crust has formed on the surface. Remove from the oven and let rest for at least 20 to 30 minutes before serving. From Dinner Deja Vu: Southern Tonight, French Tomorrow by Jennifer Hill Booker, photography by Deborah Whitlaw Llewellyn (Pelican Publishing, 2017). Chef Jennifer Hill Booker is a Le Cordon Bleu-certified chef, cookbook author, reality TV personality, culinary educator, business owner and GA Grown Executive Chef for the GA Department of Tourism and Travel. She weaves her love of traditional Southern cuisine with her belief in incorporating healthy, seasonal foods and her classic French training. Beans in cheesecake? You bet! Browse delicious and healthful bread and dessert recipes on the US Dry Bean Council's website.